Running with SD Mom: A 20 miler, Bite San Diego Foodie Tour and a new Trader Joe's Find! A 20 miler, Bite San Diego Foodie Tour and a new Trader Joe's Find! Disclaimer: I was provided a free walking tour for me and one guest. The other members of my party paid for their own tickets. I paid for my own babysitter. All opinions are my own. Happy Monday friends! Marathon training is going strong over in my neck of the woods. It is starting to pick up and I am starting to feel better about it. Maybe it has something to do with yoga or maybe because I am running my miles in wonderful beautiful places! This my friends is La Jolla Cove. Out of all the places I have run in San Diego, La Jolla has the most beautiful coast. Kristin, Jenn, Gina and I planned on a distance of 18-20 miles form Mission Beach to La Jolla Shores and back. And it was a FUN run. Hard to believe that 20 miles can be fun but it was. And the killer views and the perfect temps sealed the deal! We took my mom's car and so we felt like we were chaperoned! Haha! We started the tour at the Potato Shack Cafe which has been around for 32 years. They also have pancakes the size of manhole covers. We next headed to the Self Realization Center. This is a gorgeous place and a must visit when you are in town. Beautiful views of the sea and lush gardens. Since I am allergic to wheat, I couldn't have either item but they were so nice and brought me a salted caramel macaron! Love those! Oh and wine. Ain't no one gonna stop that! Next, the Savory Spice Shop. They had every kind of spice you can imagine. And really cool spice blends. You can taste every single spice, even the spicy ones...at your own risk. I had my nose stud in the lavender vanilla sugar bottle! They made us a dill dip and a parmesan dip. My favorite was the parmesan but the majority preferred the dill. Next - CHOCOLATE! At Chuao! We were greeted with Dulce De Leche bon bons! See those bars in front of my hand? All sorts of flavors including honeycomb and potato chip! They even sell gelato. 10% off all purchases if you are on the tour. Next stop on the tour was this guy! Kidding but I loved him and as Jenn would say, I wanted to SQUUUUEEEEZEEE him! The real next stop was the award winning Lobster West. Again, they accommodated my GF needs and presented me with a lobster roll on a GF bun. OH MY YUM! On point! Buttery and delicious! And a GF Maryland Crab soup. Also yummy and very crazy. If that makes sense! And this was Mimi, our awesome tour guide. She really knows her Encinitas. She is from Brussels and worked as a tour guide there before coming here! If you are interested in checking out a BITE San Diego tour, head to their website here. You can use code foodiefriends for 20% off your purchase. Oh and my Trader Joe's find? How many ways can you say Swedish Fish without saying it? Hilarious right?! 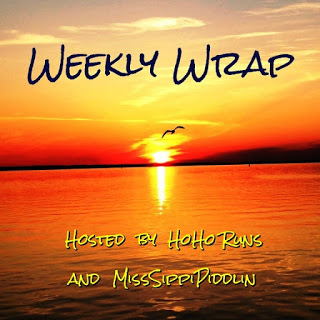 I am again linking up with the Weekly Wrap hosted by HoHo Runs and MissSippiPiddlin. So, tell me all about your weekend! Mine was jam packed and next weekend will be even crazier! Speaking of which, make sure to join me and Kristin at the We Run Social meet up! I am exhausted too! Weekends are NOT the relaxing part of the week! Wow!! Looks like such a fun weekend!! That food = AMAZING! What I could eat was amazing! Wine Wine we all love Wine! I need to move. That's all. The Self Realization Center sounds just the thing. All that food looks amazing!! Sounds like a great weekend! You run in beautiful places! Great job on your 20 miler! Running with friends makes it so much funner! I am in the middle of marathon training too, did 20 miles this past weekend.... but here in France. But California would do too ! Looks like a busy weekend but oh my goodness that looks like a tasty tour. I so need to remember that for when I make a west coast trip. Right up my alley. Oh wow we went on a pizza tour a few years ago in NY and I was so full by the 2nd stop! How fun! What a fun tour! I've only done wine tours...I do love me some vino...but never a food one. Sounds like a good time. LOL Scandinavian Swimmers! I almost got those "swimmers" at Trader Joe's over the weekend! Your views are so amazing! 20 miles and feeling good- even better! I just see houses when i run lol the beach looks awesome. Oh my goodness Smitha, there is just so much yumminess (is that a word?) in this post I really needed to eat before I saw it, lol. I can not even imagine man hole sized pancakes either! How awesome is that! Your tour look like so much fun and I'm very glad your marathon training is going so well for you, it sure does help to have the friends and beautiful views doesn't it! Thanks my friend for linking up! I'm happy to hear your marathon training is going well. What a beautiful place to run 20 miles! A foodie walking tour sounds right up my alley. I can't believe the size of those pancakes and that quiche looks heavenly. And the lobster roll? Yes, please!! Thanks for linking with us Smitha!